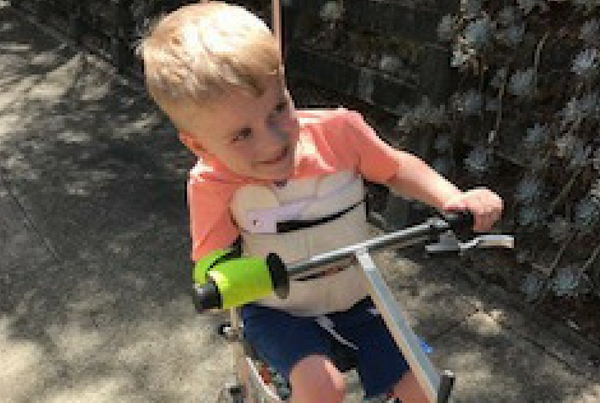 Four-year-old Archie was recently diagnosed with the extremely rare condition Acute Flaccid Myelitis and as a result does not have the muscle strength and control to ride a standard bike independently. His family, via his physiotherapist, requested $2365 from the John MacLean Foundation to buy a custom-made quadricycle so Archie can fulfil his dream of riding a bike on his own at the local cycle track 100m from his home in Cameron Park, west of Newcastle. Archie was a typical little boy who was walking, talking and reaching all of his developmental milestones. On November 24, 2016 Archie contracted a virus that changed his and his family’s lives forever. Archie spent seven months in hospital partially paralysed and incubated, eventually resulting in a diagnosis of Acute Flaccid Myelitis, an extremely rare condition that has only affected two other children in Australia. As this condition is so rare it is difficult to determine how Archie will recover, or if he will ever be able to walk on his own again. Archie has completely typical cognition and desires to have the ability to play like other children. However, he has a long road to physical recovery with regular therapy, equipment trials, and at times he is in a lot of pain. He has met all of this with exceptional resilience and determination. He is able to sit independently and currently moves around by rolling and more recently modified crawling. He requires full assistance to mobilise any other way (standing, walking, transfers etc) so there is currently no way he can participate in age appropriate outdoor activities without the full support of another person. As a result of his condition Archie has never been able to ride a standard bike safely. Archie is unable to balance on a standard bike without significant thoracic support, which is not available on commercially available bicycles. Due to Archie’s decreased muscle control in his right upper arm he is unable to grip a standard bike handle independently. It has been difficult to find opportunities to increase Archie’s exercise tolerance and muscle strength in a safe, engaging way and this new quadricycle is perfect for his current needs.